I would like to do this. I want to help out C3V with playtesting, and playtesting these would be nice too. Not sure if doing both is allowed or not. Yes, it is possible to do both. Perhaps quite draining, but if you have the time, please submit your application to be an SoV judge. MegaSilver, who realized this probably could be his Paragraph A.
EDIT: Well, I'll go ahead and start playtesting the Buccaneers. Last edited by MegaSilver; July 25th, 2012 at 05:42 PM. Just out of curiosity is anyone testing or planning to test Cxurg'gyath? It's has been under review since May 2011. I've been testing him for awhile and should have my review done soon. Common heroes combine the weaknesses of both heroes and squads: only one figure per activation and only one life per figure. The Hoplitron addresses these problems with high defense and bonding. Is it enough? There was a fair amount of discussion about the balance of the Hoplitron when it was submitted. Even considering that it has only one Life the 5/1/4/6 stats are awesome, and it also gets large and soulborg immunities. Add in bonding and Shield Push and it seems like a lot for 35 points. However they do appear more reasonable when compared to the Minions of Utgar. Minions have similar attack and defense stats (2 attack with Deadly Strike is a rough equivalent for 4 attack) and one less move with Flying, and cost-wise they are about the same on a per-figure basis. The big difference is that Minions get three figure activations per order marker, where the Hoplitrons only get two. Yes, the Hoplitrons can bond with a stronger soulborg hero instead of another Hoplitron, but currently there is no great melee soulborg hero for them to bond with. Two activations vs. three activations is a huge disadvantage, especially for melee units. Wymlings provide another comparison point, but they are difficult to compare directly. Flying units with ranged special attacks (or ranged special powers in Blackie's case) demand a very different playstyle. Even simply as filler, a run-and-gun special attacker is difficult to compare with a melee bruiser in terms of effectiveness. It really depends on the situation. I am usually very wary about abilities that move enemy figures. While in most cases it does not have a great deal of effect, on certain maps or in certain scenarios it can be devastating. I do not have much issue with Shield Push, however. The limitations of moving enemy figures only one space and requiring a 13 or higher make it a fairly limited ability that is difficult to abuse. There is still the potential to knock heroes into lava or squaddies off of cliffs, but it is inconsistent and fairly easy for an opponent to avoid. Single-life high-defense soulborgs are quite familiar, though that combination is associated more with Deathborgs than Trons. The figure used works well; it is not an easily-recognizable part of the Star Wars universe and the paint scheme works well with the Vydar soulborgs. Shield Push works well thematically with the figure's pose. The Hoplitron seems designed as both a self-contained pseudo-squad and a way to bring some underused figures (Major X17 and Deathwalker 7000) back to the table. Both are features are like to see: pseudo-squads are a good way to solve the common hero dillema without resorting to using multiple copies of a single figure in a squad, and it's always good to give a boost to underplayed figures. I am a bit tired of seeing bonding on so many units, but mixing more powerful heroes into pseudo-squad bonding is different and interesting. There are a few of these figures out there, but not in bulk that I've seen. Most of the bigger online stores are out of stock or have very few in stock. There are a bunch of eBay sellers that have a few available, but not in any large amounts. I've seen enough to give availability a pass, with the assumption that some of us already bought the numbers we wanted. Still, a few people wanting enough for horde builds could drain the market. Much of my testing focused around horde builds of Hoplitrons against various armies, sometimes mixing in Major X17 and Deathwalker 7000. With the Hoplitron's impressive stats there was some concern a horde build would overpower a lot of strong armies. Rest assured, that is not a problem. They can sometimes do very well, even dominate some matchups, but like other high-defense low-life units their strength is highly dependent on the luck of their defense dice. This is especially true for the Hoplitrons due to their poor movement. Allow me to expand on that point further, as I feel it is the Hoplitrons' greatest weakness. Movement of 5 is average, but two figures per activation is not. Almost all squads activate at least three figures per order marker, some up to five with bonding. The few two-figure squads have either range (Zettians, Mezzos) or bonding (Death Knights). The wyrmlings are a pseudo-squad of two units, but they have Flying and range which gives them a much greater threat range. Solo heroes, of course, only activate one figure per order marker, but they usually have some Life points which allow them to stay in the fray after taking some damage. The Hoplitrons move two 1-life melee units 5 spaces. That's a small front that is highly dependent on their defense dice holding out. Major X17 does help this by providing some staying power on the front lines, but he has his own weaknesses. I found it difficult to keep up a solid front when even a single unit would fall, giving up precious board control. Shield Push promises countless tactical tricks to improve board control, but unfortunately that potential is not realized in practice. There are a few reasons for this, but the biggest two are the unreliability of Shield Push and the low number of attacks the Hoplitrons get. Positioning your first Hoplitron in a tactically disadvantageous position to Shield Push something for itself or the second Hoplitron to take advantage of is not tactically valuable because it is too likely for Shield Push to fail. Pushing units away, like clearing out a screen for example, is rarely tactically valuable because doing so often pushes away the only unit that Hoplitron could attack that turn, thus giving up one of the few attacks the Hoplitrons get. Pushing units into X17's Cyberclaw or packing units in around DW7k is far easier to do in theory than practice. Shield Push is great for gaining or taking away height advantage on occasion and can also be used to break up enemy formations, and if you're lucky could net a lava or falling damage kill, but is not as useful as it seems for more advanced tactics. Despite the low number of activations and the unreliability of Shield Push, Hoplitrons can be a potent force. Their raw Attack and Defense stats are exceptional for their points; defense of 6 can hold out a long time and two attacks of 4 with Shield Push helping gain high ground offers a decent amount of punch. They excel in heroes-only formats, particularly against small/medium heroes. Outside of horde builds, the most valuable way to use Hoplitrons is probably in pairs as 70 point filler. There is little competition in that space and Hoplitrons fill it quite well. If both sides are sufficiently weakened a pair of Hoplitrons can be a strong cleanup force. As for how well they boost Major X17 and Deathwalker 7000, the answer is: a little. Major X17 is tough to kill in a melee brawl, but is a chump to range whether he bonds with a Hoplitron or not. Unforuntately his attack is no better than a Hoplitron's and he does not have the potential benefit of Shield Push. Improved Cyberclaw is sometimes useful and sometimes in the way for Hoplitrons trying to Shield Push stuff around. All in all X17 is a bit easier to get into a choke point due to the extra bonding activation, but does not perform well beyond that. Deathwalker 7000 certainly becomes more valuable due to the order marker freedom the Hoplitrons give him, but he is still a hope and a prayer with a glass jaw. His weak attack of 3 makes him an unattractive bonding choice when not blowing him up. For completeness, I will note that Hoplitrons synergize with Blastatrons. Just not well. The Hoplitron is a cheap common hero with bonding and fantastic stats. But low numbers of activations combined with a small threat range prevents Hoplitron hordes from dominating opponents. With decent performance in large numbers, especially in heroes-only environments, and strong performance in pairs as 70 point filler, the Hoplitron fits well into Heroscape. Providing a little extra value to the underplayed Major X17 and Deathwalker 7000 is gravy. I vote to induct the Hoplitron into the SoV. This will be a little more brief than usual because RL is getting in the way and I need to get this done. These guys are a 2 figure melee squad with low attack and defense so, the low price of them is understandable. However, I found that they are effective for their points without being underpriced. I love that the 2 figures look so good together…they were meant to be a squad. I feel the powers and their attributes fit them, although like Scytale I agree that Skittish might be a little out of place. I don’t know if I like or dislike that they are Raporians, but I do like that Raporians are an official race that is not represented until know, so it works for me. According to Scytale and Robbdaman there is still plenty of these guys to go around. Flocking really makes these guys work and it forces you to attack with them, which allows you to move more Sneaks up into the action. Evasive 3 helps them not easily get picked off by range as they move up the field. This also makes them a nice counter to ranged units, which is a huge plus for a melee unit. And Glide is a nice bonus on the right map. I found that they work well in hoard style armies. I also found around 4 squads to work well in a Wyrmling army or with other high price Heroes because they are so cheap it is easy to take a bunch of them and fill up your starting zone. They do rather well for their weak stats but they usually fall quickly, similar to the Vipers. I too thought Flocking might be a potential problem with moving Raptorian Heroes but after testing for this (don’t ask me how either), I found that it was not a concern and in some cases it was nice and in others it hurt you to do so, as now you aren’t moving more Sneaks to the front lines. The Sneaks are a fresh new unit including new powers and a variation of an existing power. They also play differently than other official units while filling a whole in the official canon as Raptorians. I vote YES to induct the Beakface Sneaks into the SoV. Vargach is a Lizardfolk hero who follows Ullar. 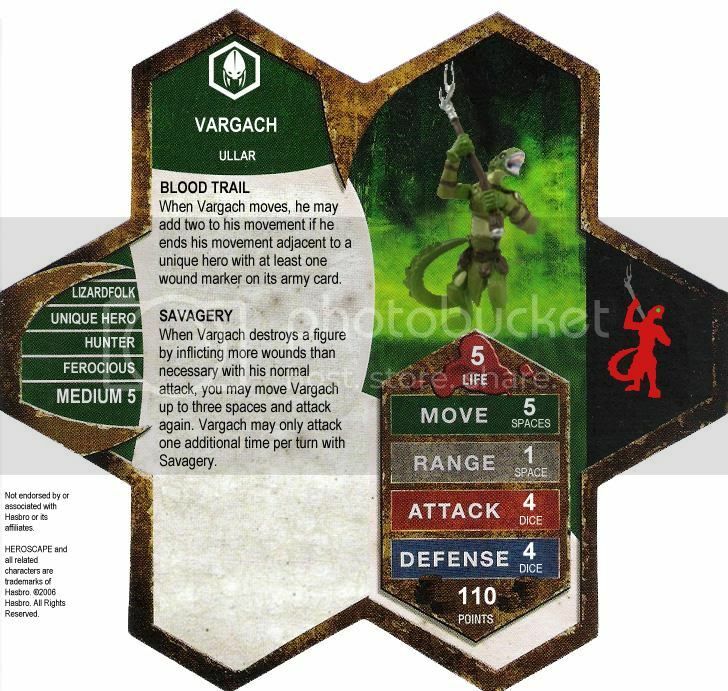 While I don't think another Lizardfolk Lizard King is really necessary, Vargach is a very different figure than C3V's Zogross Hardscale and fills a different role. He also has a fair amount of potential outside of a Greenscale build. The design looked fine to me initially, but when I sat down to play him some questions arose. First is in the wording of Blood Trail. It says he may add two to his movement if he ends his movement adjacent to a unique hero with at least one wound marker on its army card. An interesting idea, but it runs into the problem of having an immediate boost be dependent on an uncertain future event. After gaining and using the movement increase he could die to a leaving engagement attack or Engagement Strike, and thus fail to meet the requirements for the power that is already used. The Kozuke Samurai's Charging Assault is similar, but it includes the vague "must be able to" wording. If Blood Trail used the same wording as Charging Assault I would accept it, but as it is now the wording at best fails to follow precedent and at worst is problematic. Secondly I'm not certain on the intention of Savagery. Savagery allows Vargach to move three additional spaces and make another attack after over-killing a figure. It's a neat power that punishes squads more than heroes (a good thing in my book). Allowing a movement between normal attacks worries me a bit, but I can't think of any problems with it. The issue I had was with the last sentence: "Vargach may only attack one additional time per turn with Savagery". I'm not certain if Vargach is allowed to move after killing a second figure or not. By a strict reading yes, he can, he just can't attack after that movement, but the intent of the power suggests otherwise. Neither issue is quite a deal-breaker with me, but combined it made Vargach feel unfinished. My impression is that Vargach needs one more round of refining before getting SoV approval, mainly sharpening the wording to better match official precedent and clarifying intention. I did do a bit of testing to get a feel for the unit. While he does not perform especially well as a front-line Lizard King (though 5 life and 4 defense does give him some staying power), he does fulfill his role as a Hunter rather well, either as a solo hero or escorted by a small number of Greenscales. The potential is there, but I could not shake the impression that the card just isn't quite ready for an SoV stamp of approval. I vote to induct Vargach into the SoV. For the Dashi Tokainto card his class is Jonin, I did not know what that was so I Googled it and it was a high ranking ninja in Naruto, but I could not find it used outside of Naruto. My question is, is Jonin exclusively a Naruto term, because if it is I would be strongly against it being used for a card that could become "official" in the future. Last edited by infectedsloth; August 2nd, 2012 at 01:25 PM. I don't think that it is exclusively a Naruto term. Some of the ninja leaders, or jonin, were disgraced samurai like Daisuke Togakure. They had lost in battle or had been renounced by their daimyo, but fled rather than committing ritual suicide. The ninja "high man," or jonin, gave orders to the chunin, "middle man," who passed them on to the genin, ordinary ninja. I really liked the idea of another Elf hero…because I am a huge fan of Elves in general. So when Clyemne was submitted I was a little excited. I like the fact that she works well with the Warriors of Ashra but I really don’t think that they need the help. After doing some initial playtesting to get a feel of her I found a few problems that concern me, on top of Scytale’s concern. First, she is only 80 pts. and has solid stats with 5 life/ 3 Attack/ 4 defense. With that added to Ashran Fury she becomes a force to be reckoned with. There was not one time that I was not able to get at least 1 if not more WoA adjacent to her target; boosting her attack to 4, 5, or 6. Second, Ashran Fury has no limit like other Elf abilities. She could, though not very likely to occur very often, have an attack of 8. But is I mentioned above it was very easy to gain that extra 1 or 2 attack dice every turn. Finally, Captain’s Assault, my biggest concern. At first I liked this, but after playing I found that I do not agree that “Bonding” should happen this way. All other bonding abilities require the player to reveal an OM on a card, and then an ability on that card allows the Bonding. This is not the case here; as this Power comes into play after taking a turn with the WoA and the OM on their card. This along with Ashran Fury turns the WoA and her into a swam army, which I don’t know that I really like for the Elves. There are some neat ideas but, there is just too much going on for one card. She needs to have her stats adjusted with a change/drop of her powers. I vote NO to induct the Clyemne into the SoV. The figure is MERCS Keizai Waza Demolition, it's available from miniaturemarket, fantization, FRP games, noble knight, the warstore, and others. Thank you for considering my nomination. I love the mini and the powers and the attention to game balance, with the Defense 3 and the 3 range on the special. The price looks about right, too. There is a misspelling, though, and without checking I'm not completely sure you copied and pasted powers correctly. Though I like very much how you're essentially recombining canonic powers here. Not that I vote, anyway. Thanks Fishguy for your nomination, while the design seems sound...the figure choice is not. I am not ready (and most Scapers agree with me) to begin adding non-assembled, non-painted, miniatures into the canon. I vote NAY to review Jerak Guy. I am a bit concerned about adding powerful heroes to the Mariedian forces due to the free movements offered by the M-43s, but I would have to playtest to really get a feel. Overall a solid use of existing powers to make a hero to fit in a new faction. But there are problems with this card. 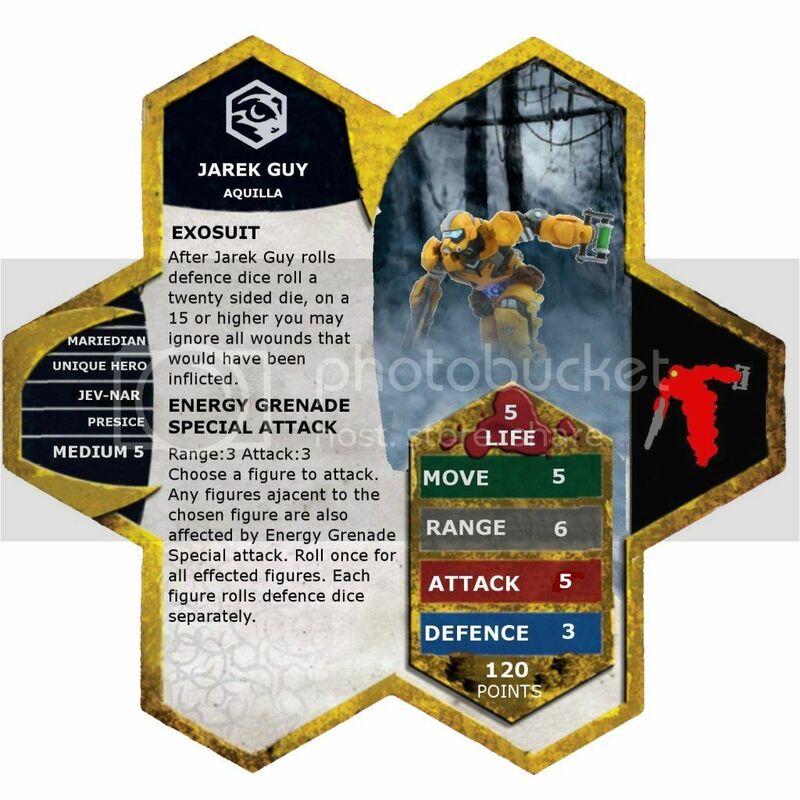 A few spelling errors (Heroscape uses the "defense" spelling, "ajacent" should be "adjacent", "effected" should be "affected"), and the powers should be reworded to match Heroscape precedent (use the Microcorp's Stealth Armor and Deathwalker 9000's Explosion Special Attack for reference). I'm also not convinced we should be going to unpainted minis. I might be persuaded for squads, but there are still lots of pre-painted minis to be used for heroes. I vote Nay to review Jarek Guy.